Edeka's festive offering featuring a man pretending that he is dead to bring his family together for Christmas is once again in the top spot. In the battle of the Christmas ads, Edeka is eclipsing the competition. 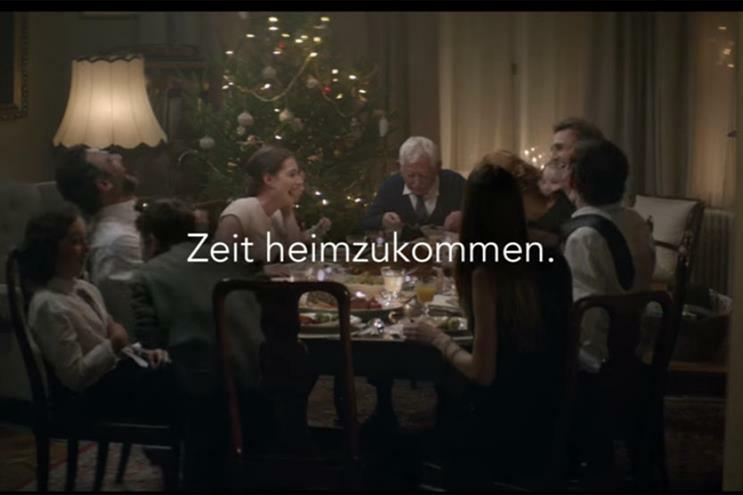 The German supermarket’s story of a grandfather’s attempts to bring his family together for Christmas is once again the most shared ad of the week. It was shared 1.1 million times in the last seven days. The video site has collated a number of the top videos, people and music featured on YouTube throughout the year. The film has been shared 101,441 times this week. John Lewis’ heartfelt ad, where an old man alone on the moon receives the gift of a telescope from a young girl, is probably one of the most recognisable ads of the season. The collaboration with Age UK has been shared 73,701 times this week. That’s an awful lot of telescopes. From the bed-time stories of many children up and down the UK, Judith Kerr’s lovable Mog made the jump into the ad world this Christmas. Sainsbury’s Christmas story sees the forgetful cat experiencing a whole series of catastrophes. The film was shared 45,728 times this week. If anything is a guarantee of viral success, it’s probably to get some footage of an animal being cute. That’s the formula Amazon Prime has gone for at least, with this ad focusing on the loneliness of a very tiny horse. Add some catflaps and a caravan and you have a hit. The ad has been shared 25,301 in the last seven days. 6. Victoria’s Secret "lip sync ‘Hands to Myself’"
If cute animals aren’t a guarantee of viral success, then getting some of the world’s most beautiful women to lip sync and dance around beaches, bedrooms and gyms in their underwear might be another option. Cue the Victoria’s Secret Angels, doing what they do best. In the hype following the annual VS Show in New York, it’s hardly surprising this is climbing up the viral chart. It was shared 16,114 this week. 7. Apple "someday at Christmas – Stevie Wonder and Andra"
Apple really has poured on the Christmas spirit with this one. Fairy lights, snow, glamour and a song from Stevie Wonder. What more could you want for Christmas? It has been shared 15,408 times in the past week. The latest in Volvo’s series of live tests sees four-year-old Sophie remotely taking the wheel of a Volvo lorry and driving it around an obstacle course. Unsurprisingly, chaos ensues. The ad has been shared 12,535 times this week. 9. Coca-cola "Coraz blizej Swieta"
To say that this ad was festive would be a very big understatement. There’s Christmas trees, fairy lights, Christmas jumpers, wooly hats, a reindeer made of fairy lights and even a gold leather jacket. Even people who do not understand the singing (it's in Polish) will not be able to deny this ad from Coca-Cola is full to the brim of Christmas charm. The video has been shared 9,212 in the past week. A young boy brings locals together to get them into the Christmas spirit. The ad has been shared 7,906 times this week.